This exhibition is organized by the American Federation of Arts and the Smithsonian’s National Museum of the American Indian. 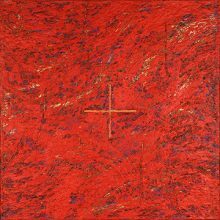 Kay WalkingStick: An American Artist surveys the career of one of today’s most accomplished American Indian artists. Over the course of more than four decades, WalkingStick has avidly explored her own hybrid cultural identity, engaging Native history along with feminism, Minimalism, and other key art historical movements. She has become particularly renowned for her majestic and sensual landscapes, which imbue natural scenery with the charge of personal and collective memory. The exhibition reveals WalkingStick’s diverse approaches to painting over the decades—from graphic figurative work to lushly layered expressionism—and includes a range of her signature diptychs. Co-curators Kathleen Ash-Milby, Associate Curator at the Smithsonian’s National Museum of the American Indian (NMAI), and David Penney, NMAI’s Associate Director of Museum Scholarship, have selected 39 of the artist’s most notable works. In addition to tracing WalkingStick’s artistic journey, the exhibition engages issues of race, identity, and national history, which are key themes not only to contemporary Native art but to American culture at large. This touring retrospective is the first to fully examine WalkingStick’s singular career, demonstrating the breadth of her achievements. 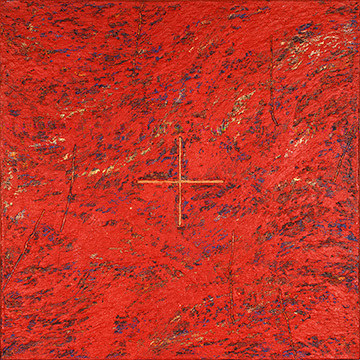 WalkingStick’s abstract paintings, landscapes and diptychs have a worldwide following. The exhibition, displaying works spanning more than 40 years, has been drawn from public and private collections, including the Heard’s. Kay WalkingStick was one of the honorees for this year’s Moondance gala at the Heard Museum on Oct. 22, 2016. 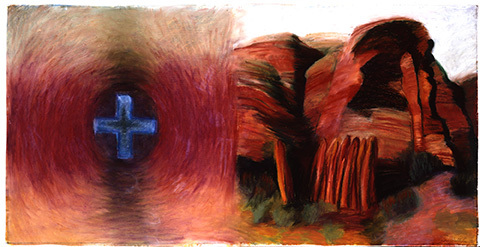 Kay WalkingStick (Cherokee/Winnebago), “The Vortex” (1995), oil stick on paper, 34 x 68. Heard Museum purchase. Photo by Craig Smith/Heard Museum.